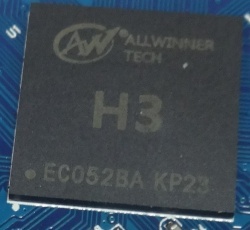 Allwinner H3 (sun8iw7p1) SoC features a Quad-Core Cortex-A7 ARM CPU, and a Mali400 MP2 GPU from ARM. The Allwinner H3 is a highly cost-efficient quad-core OTT box processor, primarily marketed as being for "home entertainment" systems. It has a nearly-compatible variant known now, H2+. It's rated to run at 1.296GHz, anything higher is overclocking (and usually overvolting). If you run it without heatsink, fan and proper dvfs settings, you risk overheating. See Mainlining Effort and Mainline U-Boot for support status. AR100, an OpenRISC controller. Manages deep powersave modes. H2+ is a variant of H3, targeted at low-end OTT boxes, which lacks Gigabit MAC and 4K HDMI output support. H3 images are proven to run on H2+. According to the source code of BSP, variants differ by the last byte of the first word of SID. 0x42 and 0x83 indicates H2+, 0x00 and 0x81 indicates H3, and 0x58 indicates H3D (a still unknown variant). Starting with version 2016.01, the official mainline U-Boot has supported the H3 SoC and various boards with it. This is the recommended way of booting boards when not using BSP kernels. The mainline Linux kernel supports the H3 SoC quite well. For a more comprehensive list of supported features, see the status matrix for mainline kernels. This page was last modified on 27 December 2018, at 00:54. This page has been accessed 223,263 times.